In recent years, several organic herbicide products have appeared on the market. These include Weed Pharm (20% acetic acid), C-Cide (5% citric acid), GreenMatch (55% d-limonene), Matratec (50% clove oil), WeedZap (45% clove oil + 45% cinnamon oil), and GreenMatch EX (50% lemongrass oil), among others. These products are all contact-type herbicides and will damage any green vegetation they contact, though they are safe as directed sprays against woody stems and trunks. These herbicides kill weeds that have emerged, but have no residual activity on those emerging subsequently. Additionally, these herbicides can burn back the tops of perennial weeds, but perennial weeds recover quickly. These products are effective in controlling weeds when the weeds are small and the environmental conditions are optimum. In a recent study, we found that weeds in the cotyledon or first true leaf stage were much easier to control than older weeds. 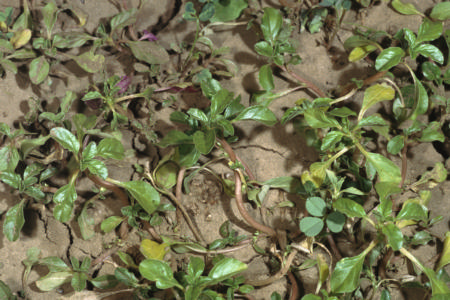 Broadleaf weeds were also found to be easier to control than grasses, possibly due to the location of the growing point (at or below the soil surface for grasses), or the orientation of the leaves (horizontal for most broadleaf weeds). Adding an organically acceptable adjuvant has resulted in improved control. Among the organic adjuvants tested thus far, Natural wet, Nu Film P, Nu Film 17, and Silwet ECO spreader have performed the best. The Silwet ECO spreader is an organic silicone adjuvant which works very well on most broadleaf weeds, but tends to roll off of grass weeds. The Natural wet, Nu Film 17 and Nu Film P work well for both broadleaf and grass weeds. Although the recommended rates of these adjuvants is 0.25 % v/v, we have found that increasing the adjuvant concentration up to 1% v/v often leads to improved weed control, possibly due to better coverage. Work continues in this area, as manufacturers continue to develop more organic adjuvants. Because organic herbicides lack residual activity, repeat applications will be needed to control new flushes of weeds. Temperature and sunlight have both been suggested as factors affecting organic herbicide efficacy. In several field studies, we have observed that organic herbicides work better when temperatures are above 75F. Weed Pharm (acetic acid) is the exception, working well at temperatures as low as 55F. Sunlight has also been suggested as an important factor for effective weed control. Anecdotal reports indicate that control is better in full sunlight. However, in a greenhouse test using shade cloth to block 70% of the light, it was found that weed control with WeedZap improved in shaded conditions. The greenhouse temperature was around 80F. It may be that under warm temperatures, sunlight is less of a factor. Organic herbicides are expensive at this time and may not be affordable for commercial crop production. Because these materials lack residual activity, repeat applications will be needed to control perennial weeds or new flushes of weed seedlings. Finally, approval by one's organic certifier should also be checked in advance as use of such alternative herbicides is not cleared by all agencies.